What does a Thanksgiving meal cost? Here are some facts to chew on while you digest your Thanksgiving meal. According to the American Farm Bureau Federation's (AFBF) latest price survey, the average cost of a classic Thanksgiving dinner for 10 people this year -- with all the fixings - will come to $49.41, or up 37 cents from last year. The centerpiece of that feast, a 16-pound turkey, costs $21.85, or about $1.35 per pound, down slightly from 2013. "Turkey production has been somewhat lower this year and wholesale prices are a little higher," AFBF deputy chief economist John Anderson said in a statement, "but consumers should find an adequate supply of birds at their local grocery store." A major factor behind that price increase is the rising cost of the grains, especially soybeans, used to feed the birds. But even with growing production costs many supermarket chains sell turkey as a "loss leader," offering it at a loss to bring in customers who they hope will buy other products. "They'll sell it for less than they paid for it," Steve Olson, the Minnesota Turkey Grower's executive director, told CBS affiliate WCCO-TV. "While that's great for consumers, on the other hand it gives the impression that that's what it should cost year round." Other traditional Thanksgiving foods showing the largest price increases this year are sweet potatoes, dairy products and pumpkin pie mix. 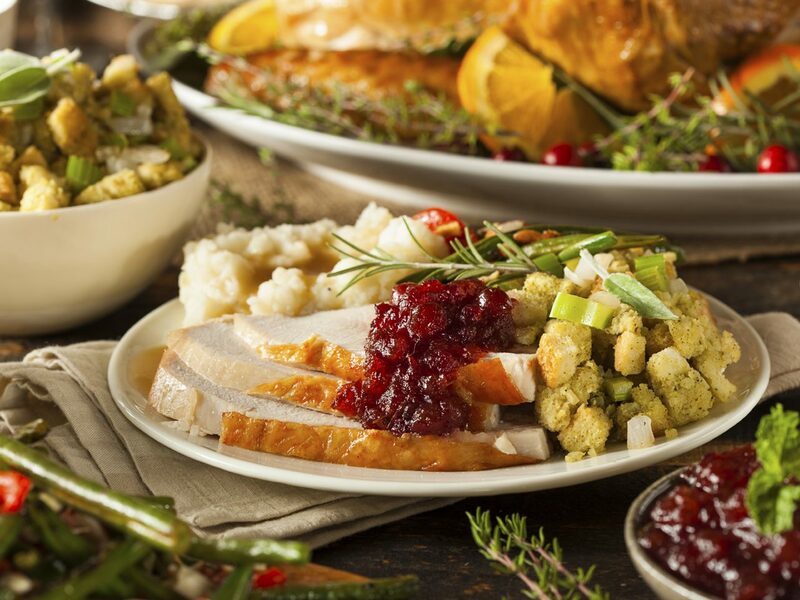 Add in other holiday staples like cranberries, bread rolls, assorted vegetables and coffee, and the cost of a typical Thanksgiving meal for 10 is still something of a bargain, coming in at around $5 per person. But let's talk turkey about that great native bird. According to the National Turkey Federation (NTF), U.S. turkey consumption has more than doubled over the past 45 years. As of last year Americans ate an average of 16 pounds of turkey per person annually, or nearly double what they consumed in 1970. Turkey is the fourth most-consumed meat in America, after beef, pork and chicken, and in 2011 the total value of the nation's turkey processors' production was around $18 billion. Over the past 20 years U.S. turkey products have also developed a large export market, with 758 million pounds of the bird shipped out of the country last year. The top five foreign markets for turkey in 2013 were Mexico, Canada, Hong Kong, South Korea and Russia. And turkey is no longer just for Thanksgiving. The NTF says two-thirds of the turkeys eaten in the U.S. are consumed during the first eight months of the year.